Costa Del Mar Brine Sunglasses are right at home in a saltwater environment and are equipped to enhance your vision in extreme fishing situations. Costa is an innovative eyewear brand that is made for fishermen by fishermen. Cold-injected nylon and Hydrolite frames grip the skin tighter when exposed to water or sweat. Full Mirror Coating available on certain lenses which reflect back glare and UV rays from the sun. Costa Del Mar Sunglasses include a Costa Del Mar protective carrying case and cleaning cloth. 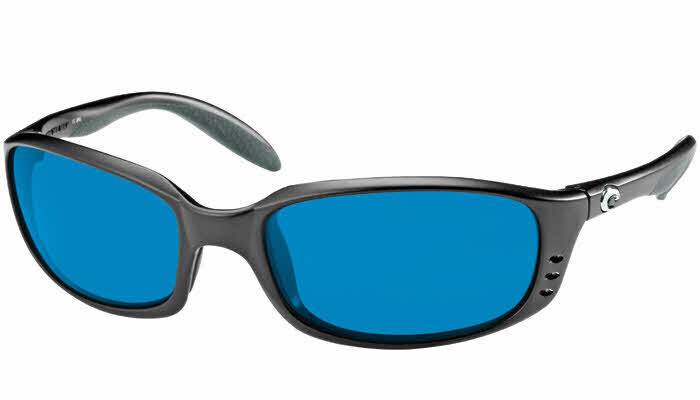 The Costas Brine sunglasses with the blue tint lenses are exactly what my son desired for his birthday (18). The online experience was simple once the order was placed. We received email communication about the order status. The quality of the product was excellent and not a "knock off" which is the greatest fear of all online purchases. We also found the price was the most competitive of all the locations we searched even with coupons available for some outlets. We will return to this site for future purchases. This is the 2nd pair of Costas that we have owned. Great sunglasses and wonderful customer service from FramesDirect.com. I purchased these Costa Brine sunglasses for my son. We ordered them without a lot of prior knowledge of this particular pair. However,when we received them he was very impressed with the quality and style. He is totally satisfied with the purchase. He has even recommended them to his brother. This was also our first purchase through Frames Direct. I was pleased with the entire process and will be purchasing our next pair from them. These sunglasses are GREAT! I'm always working and fishing and these fulfill all my needs. When you sweat they do hold onto your face and stay on but sometimes mine fog up when I sweat. Besides the little fog the brines are AWSOME! !